Customizing your survey templates can give a more personalized experience for your customers and help improve your response rate. 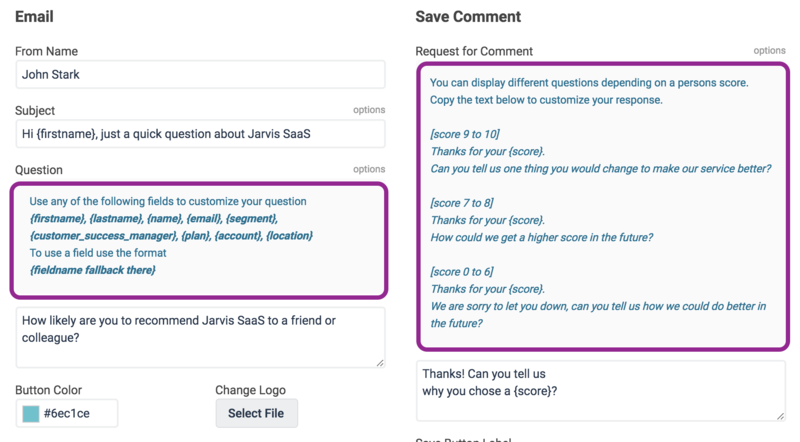 You can customize your survey templates with the same custom data points that you customize other emails with, and you can also create different templates based on a certain custom data tag. For example, if you want to create different templates per account manager, or use templates specific to a certain customer’s language, then you have the ability to do this from the Settings tab in AskNicely. You can choose to create templates based on either the segment, or custom data points. Some of the common template differentiations we see are based on language, lifecycle stage of the customer, or relational vs. transactional. Once you choose the type of segmentation you’ll use for your templates, you have the ability to use the rest of your custom data points to customize that template. By clicking any of the “options” links, you’re able to see the different custom data tags that can be used to customize your templates. By customizing the templates based on specific segmentation of your customer base, you’re able to ensure the most personalized experience for your respondents and increase your overall NPS response rate.